Oh what a fun article to read! I just love family reunions – we never have enough of them, in my opinion! Your July sounds like our August in terms of birthdays; we have eight next month. I hope everyone has a great birthday. 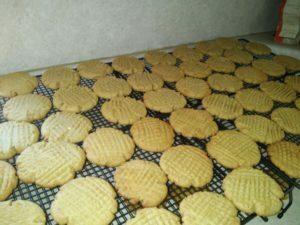 Thank you so much for the peanut butter cookie recipe. 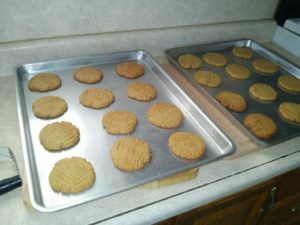 Peanut butter cookies are my husband’s favorite and I always enjoy trying a new recipe. Merri, coffee soup is just hot coffee mixed with your choice of cream or milk. Pour it over a bowl of torn up bread or biscuits or toast. Sweeten to taste with brown or white sugar. I like it made with unsweetened coffee over cinnamon raisin bread toast. I love reading all your articles. It brightens my heart whenever I read about all the extended family getting together. Thanks for the cookie recipe. Thanks, as always, Cherese, for commenting here! I enjoy reading about your family reunions! When I was young, they were much looked forward to..now the younger generation doesn’t seem interested. I think that is sad, everyone is too self absorbed. Just another reason to love the Amish…family is still important!! As a culture, we should follow this example. We also have several birthdays in July, mine included. Tomorrow, my youngest grandson turns six! Thanks for the always interesting glimpse into your life! Hope you had a great birthday as well, Barb. Thanks for your comment. As young people grow older, some do develop more of an interest in their family connections. Keep trying! See Athanasia’s very good description below. Thanks, Athanasia!